The Hox Cup Sake Bar is a one week pop-up taking place in the courtyard of the Hoxton Hotel in Great Eastern Street, Shoreditch from Monday 29th February to Sunday 6th March. Featuring 20 different varieties of 'cup sakes', individual portions beautifully packaged and originally created for the Tokyo Olympics of 1964. There are events on some nights, but its open on weekday evenings and from noon at the weekend. A great opportunity to get to know sake! 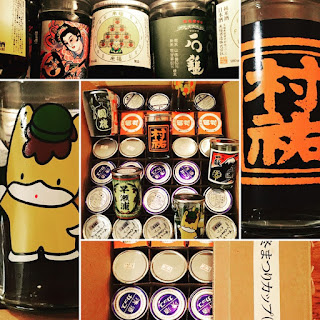 "The Hox Cup Sake Bar will showcase 20 different varieties of cup sakes gathered from across Japan, in the garden courtyard of The Hoxton, Shoreditch for the first week of March. In somewhat eager anticipation of the 2020 Tokyo Olympics, visitors can watch original Tokyo ‘64 footage around a 20m long concertina paper bar, with sake sommeliers to guide them on their tasting experience. Natsuki Kikuya from the Museum of Sake has curated the largest collection of cup sakes in the UK. Such a variety is rarely available outside of Japan, and visitors will be able to sample many styles and take home the decorative one cup containers as souvenirs. There will also be a series of exclusive tasting events hosted by Natsuki, matching different sakes with a range of local Hoxton food makers."